This is a review of Dr. W’s Healthy Hair 365. This product claims to repair brittle or dry hair, eliminate the breaking of hair, stop the shedding of hair, and thicken your existing hair. In addition, it claims to often have a positive impact on the strength and quality of your nails, eliminating cracking and breakage as well is accelerating growth. Dr. W’s Healthy Hair 365 also suggests that it has a positive impact on your skin quality, softening and smoothening the skin. Adults are to take 1 pill, twice daily. It is suggested that these pills be taken with food, to ensure maximum absorption. Not suggested for children. No negative side effects have occurred, according to the company’s website. It is suggested that if you are a nursing mother, pregnant with child, or currently taking medications, you should seek out medical advice before starting Dr. W’s Healthy Hair 365. It is also stated on the company’s website that, without normal levels of nutrition in your day-to-day diet, this supplement isn’t nearly as effective. In addition, the company mentions that this supplement could possibly have beneficial impacts on the following conditions: Telogen Effluvium, hair shaft defects, hypothyroidism, Discoid Lupus Arythematosus, Trichotillo Mania, as well as several types of Alopecia. One 30-day supply of Dr. W’s Healthy Hair 365 costs $39.97, while one 90-day supply costs $89.97, for a total savings of $30. No monthly subscription is available at this time. After an extensive search, no mention of a guarantee could be found anywhere on the company’s website. This is especially concerning, as Dr. W’s Healthy Hair 365 says you need to use it for up to 90 days to see results. Additionally, no reviews can be found on the company’s website, which leaves no opportunity to evaluate this product prior to purchasing it. Dr. W’s Healthy Hair 365 is a dubious product, at best. On the plus side, it does indeed contain several vitamins essential to the average person’s ability to build protein in their body. It also contains high enough levels of these active compounds to be effective in aiding the human body in the production of these proteins. But unfortunately, no peer-reviewed scientific studies can be found that show a direct correlation between high concentrations of these ingredients and improvement in hair quality. This is concerning primarily because Dr. W’s Healthy Hair 365 is being sold & marketed by a professional, experienced dermatologist, the type of individual who should understand the need for hard scientific data. Also troubling is the complete lack of additional retailers marketing Dr. W’s Healthy Hair 365, which leads me to doubt the effectiveness of this product. 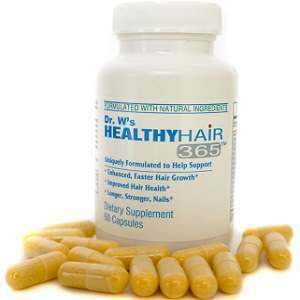 Without any real information to support the claims behind Dr. W’s Healthy Hair 365, potential customers should consider other available options before purchasing this product. John Brownstone	reviewed Dr. W's Healthy Hair 365	on June 25th	 and gave it a rating of 3.